Im Herzen der Neuseeländischen Alpen wartet der Arthur's Pass National Park mit einer unglaublichen Vielfalt an Flora und Landschaft. 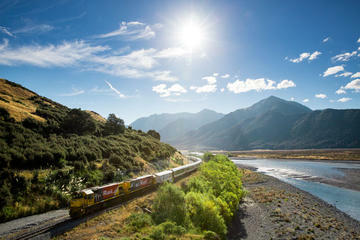 Erleben Sie eine atemberaubende Reise mit dem TranzAlpine Train, der sich durch die prächtige Landschaft von Waimakariri Gorge schlängelt. Sie unternehmen kurze Führungen zu Regenwälder, Flüssen und Bergen und besuchen die unglaublichen Felsen von Castle Hill. Sie reisen in einer kleinen Gruppe mit maximal acht Teilnehmern, was ein persönliches und informatives Erlebnis bedingt. Peter our friendly guide picked us up and customized our day, accommodating our preferences and the weather. Awe inspiring scenery, despite the incessant drizzle, tempered by Peter’s informed observations plus a comfortable train and minibus drive, made for an interesting day. Should not be missed! Beautiful views, comfortable train ride and great hiking after we were off the train with the group. Out tour guide, George, was terrific and knowledgable, taking us to a number of interesting places including the amazing Castle Hill. Great tour guide - Train to pass was crowded, but commentary very educational with great views and vistas. Met our tour guide for a van trip into Arthur's Pass, walk through a forest area, that was a little more difficult than I anticipated. Tour guide was helpful in helping me complete the trail, which had several steps throughout both down and up with no handrails for support. She rewarded us with brownies, tea or coffee, which was nice Another stop for lunch and scenic views - Good lunch, though slow service. One more stop on way back to Christchurch. Overall a good experience with an interesting small group of 6 and our guide. Awesome trip!! I was traveling alone so it ended up being worth the money for me in terms of having a group to travel with. If you're already with a group already however it would way cheaper to just do the itinerary on your own if you are able. If you like comfort and convenience then this is definitely the way to go. You get to just sit back relax and enjoy while someone else handles all the logistics, which in and of itself it super valuable. The trip itself is just amazing, the natural beauty in NZ is astounding. Again, you could see all of it on your own with booking this tour, but it does have it's perks. I think it just depends on your circumstances. If you have the money and like convenience, it could be a good fit for you. Started at 7.15 am with the prompt arrival of Peter our guide for the day. Great Experience - beautiful scenery from the train going there, while there and while headed back. John was a great guide and a great host and company for the small group! The walks were intensive but uncomplicated and the scenery quite breathtaking. Great tour! Fiona is an excellent guide!!! My tour leader: Chris Platt is very nice person. he is friendly and helpful. I like the national park, amazing..